Plot: Frank, a single man raising his child prodigy niece Mary, is drawn into a custody battle with his mother. Starring: Chris Evans, Mckenna Grace, Lindsay Duncan, Octavia Spencer. distributed by Fox Searchlight «Gifted» in the US movie theaters released on April 7, 2017 and has grossed over $43 million worldwide; dvd and blu-ray release date was set for July 25, 2017. Rent from Netflix and Redbox from August 1, 2017. 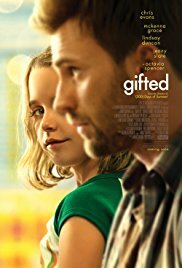 «Gifted» in the UK released in movie theaters on June 16, 2017. The movie released on dvd and blu-ray on October 23, 2017.